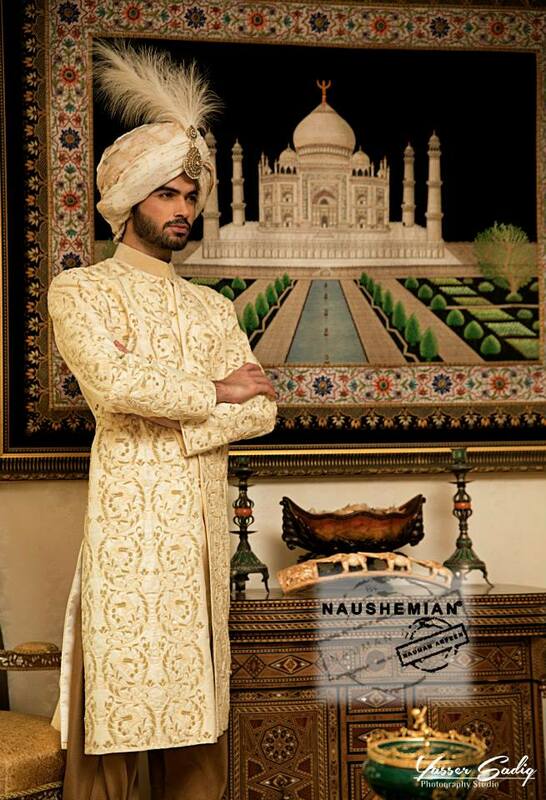 Naushemian by Nauman Arfeen is the well-preferred brand by people. 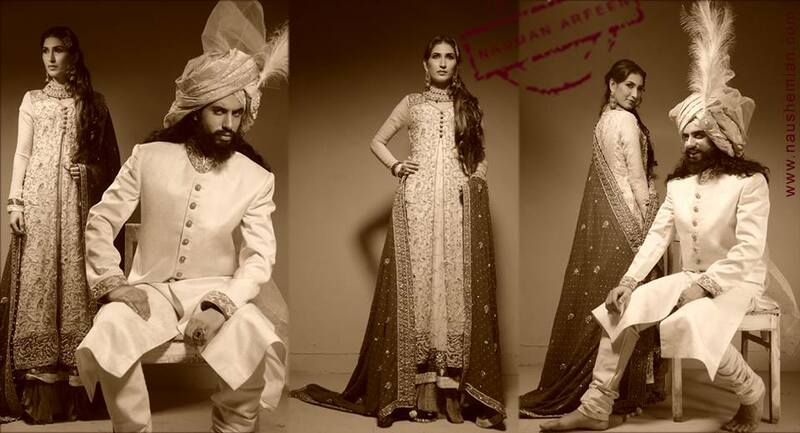 It has gained a well-earned popularity of producing the most gratifying wedding trends of groom wears dresses and accessories. It is accessible to many local markets and shops supplying the high-quality stuff. 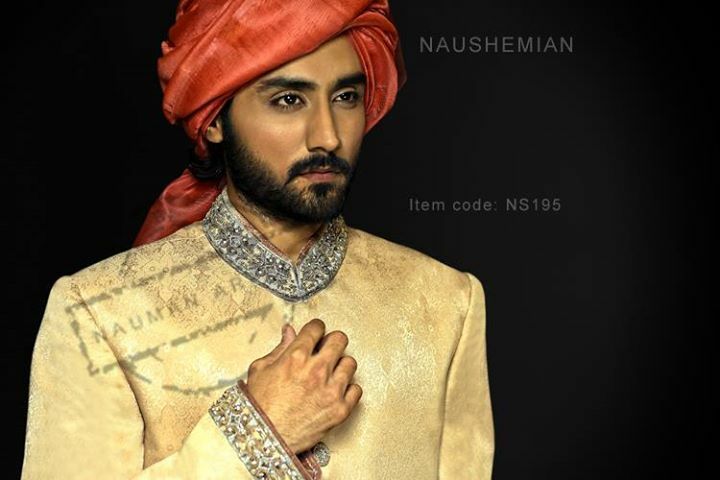 Nauman Afreen has a team of professional designers, stitchers, and cutters. 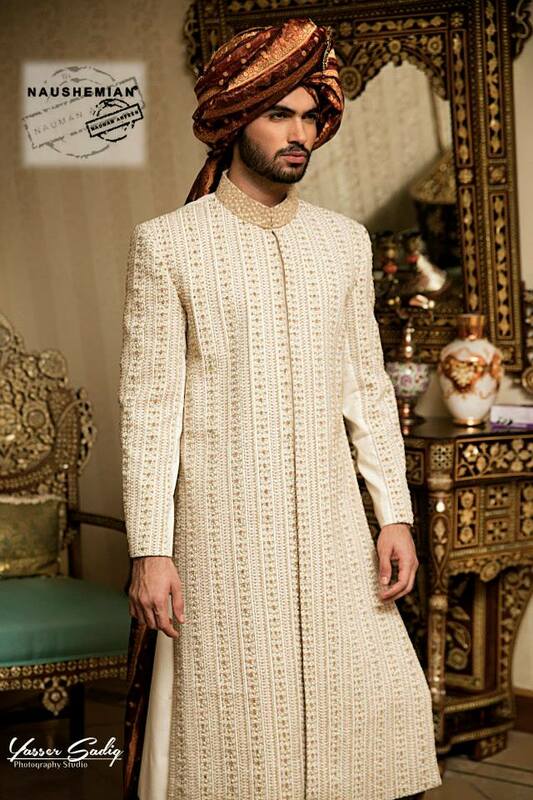 It’s wedding sherwani designs are not only popular in Pakistan and highly favoured in India, Bangladesh, and other international countries. 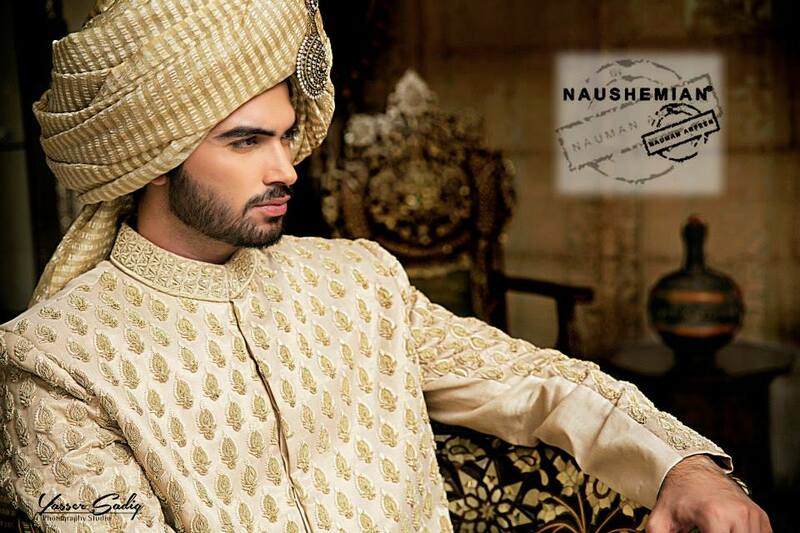 Naushemian has taken part in many bridal couture weeks and displayed his latest collection and got huge fame from that. 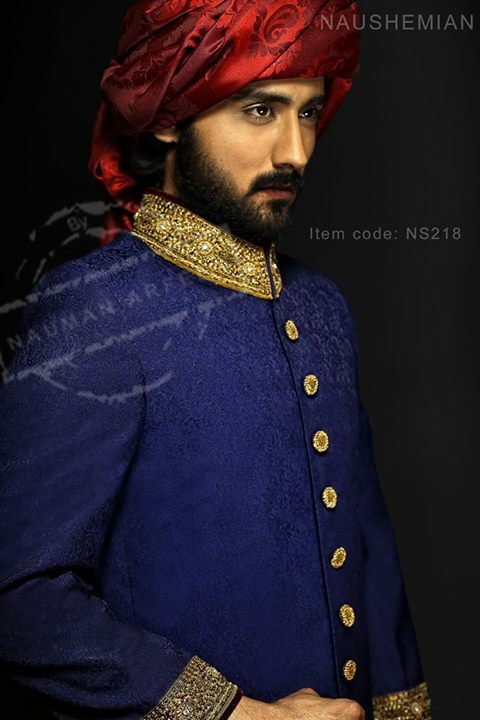 It is currently one of the top-rated groom wear brands all over Pakistan. 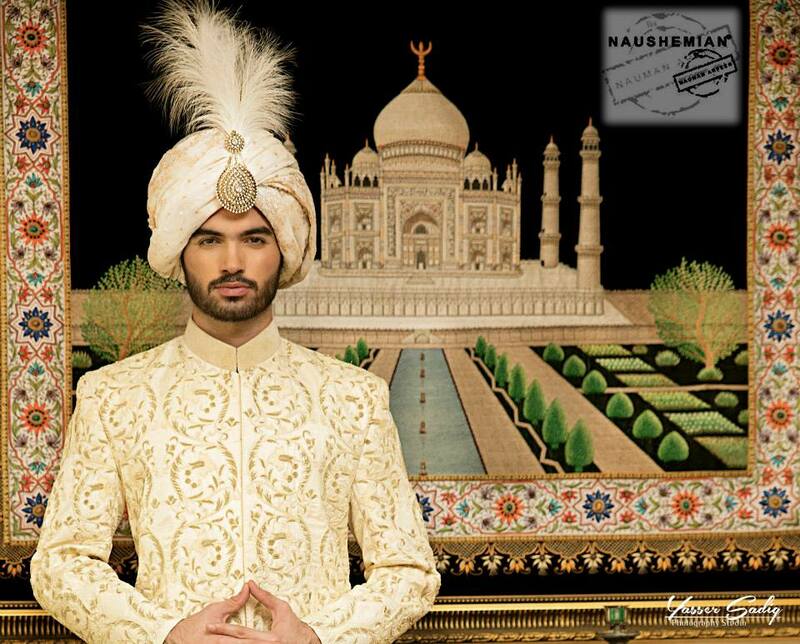 The brand specifically designs men wide range of Indian and Asian inspired sherwani with royal diadème. 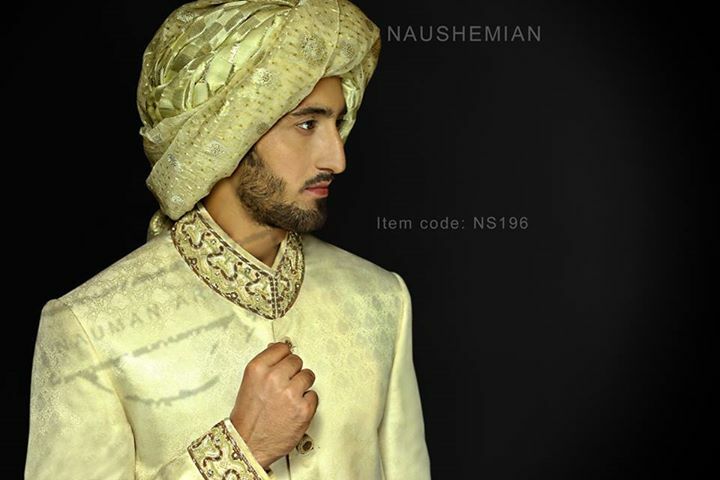 Naushemian’s by Nauman Arfeen groom wear deals and packages are interesting. They are incredibly liked by the customers. 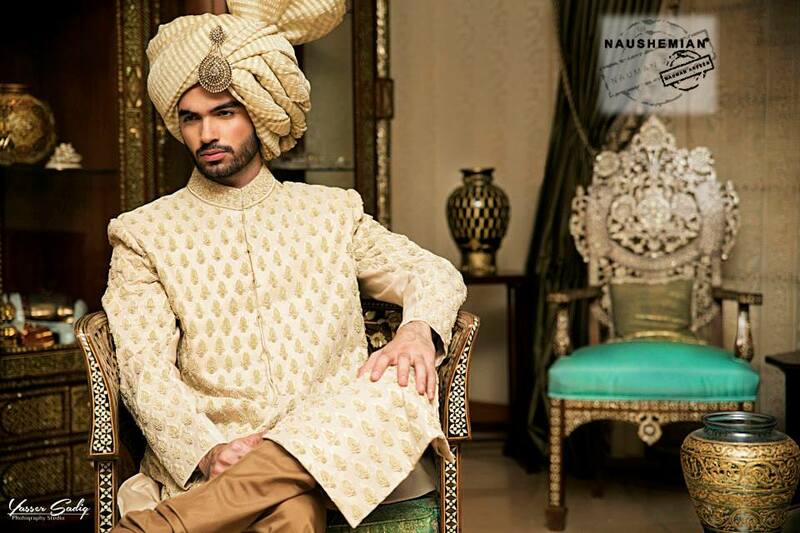 The magnificent bridal wear having exquisite and delicate designs of Lenghas, formal wear frocks, and party wear to comply with the flavors of Naushemian’s brides. 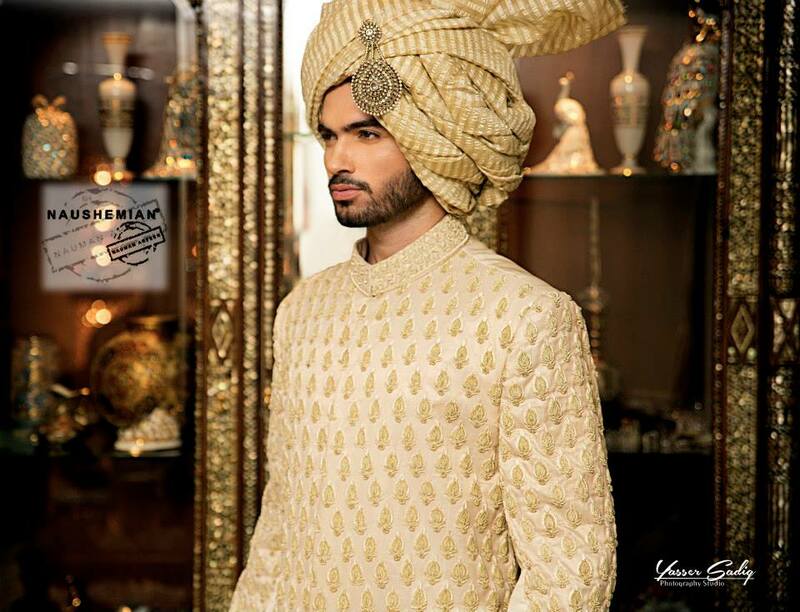 Asian grooms-Dulhas mostly wear sherwanis paired with pajamas, shalwar and jeans on their wedding day. 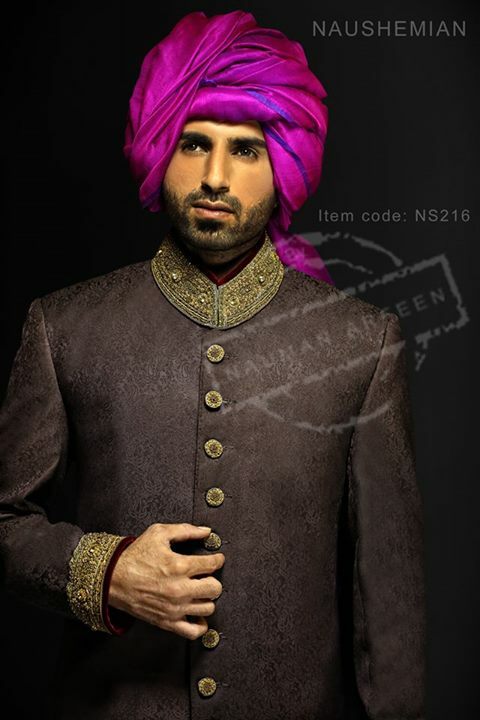 Sherwani Dress is mostly worn on Barat day that is the main event of a wedding ceremony. Almost the whole Asia have same cultures with some different traditions. 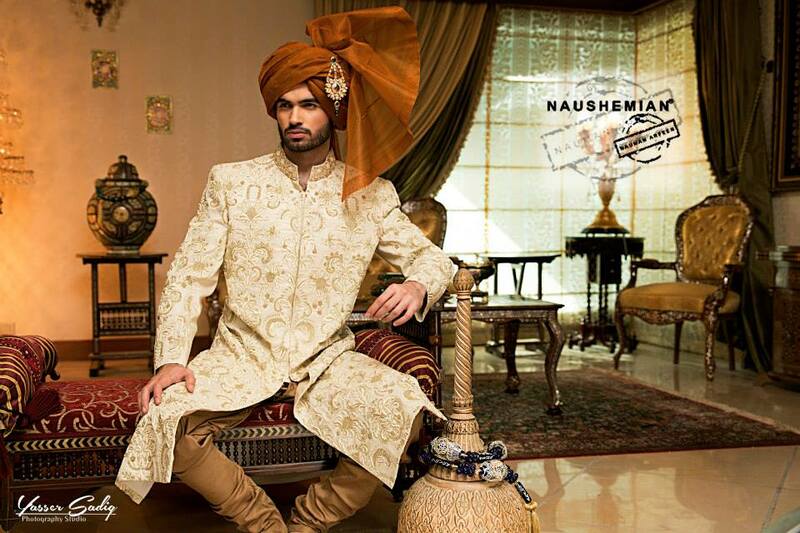 Pakistani and Indian Dulhas like to wear sherwanis on their BIG DAY. 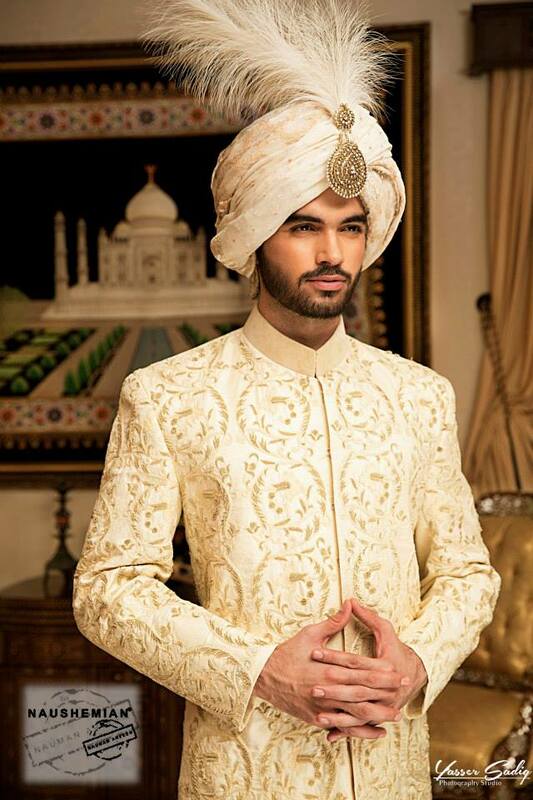 If you are having your wedding near then no need to worry about selecting the appropriate dress. 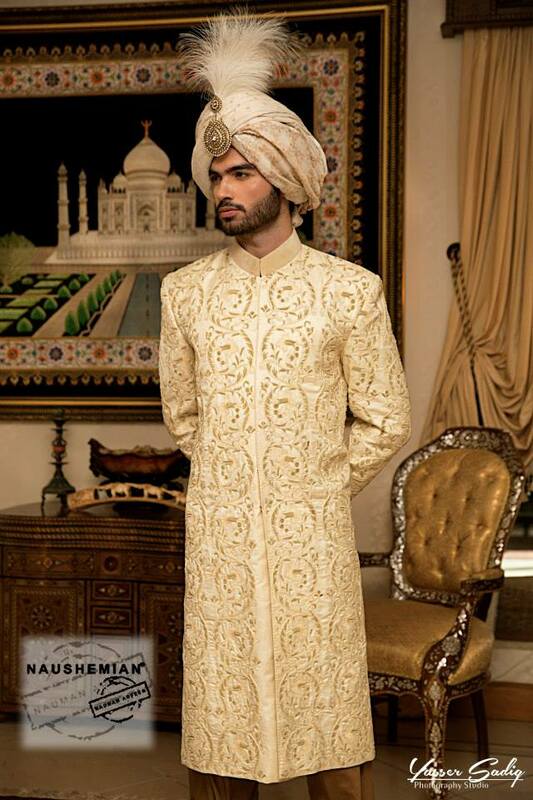 Just like women we are also sharing the gallery of perfect wedding dresses for men. It will help you in choosing the right outfit for yourself. 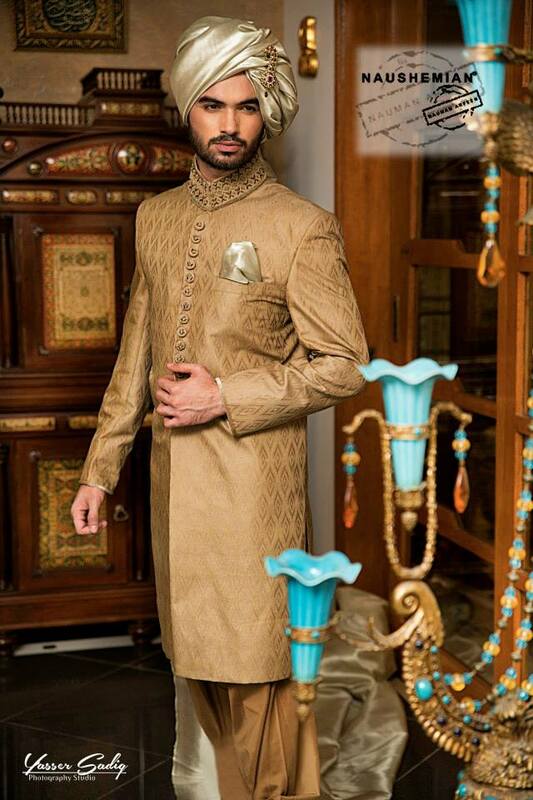 You can also shop it online or just note the article to design an exclusive item. 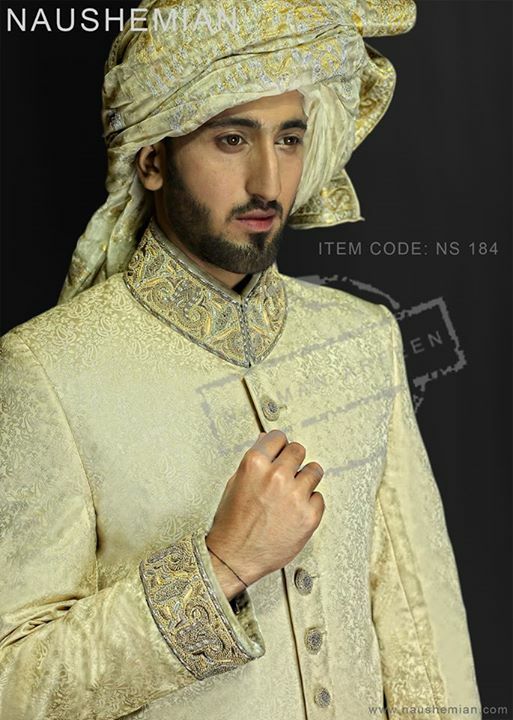 Talking about the latest groom sherwani collection for Pakistani, Indian and Asian Men all around the world; it is full of delicate embroideries having needlework art, thread work, stones, etc. 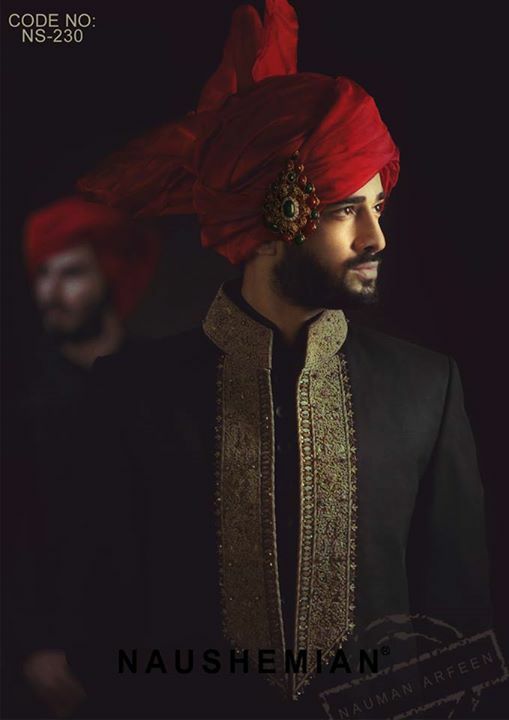 The trendy tilla work at necklines looks so impressive. 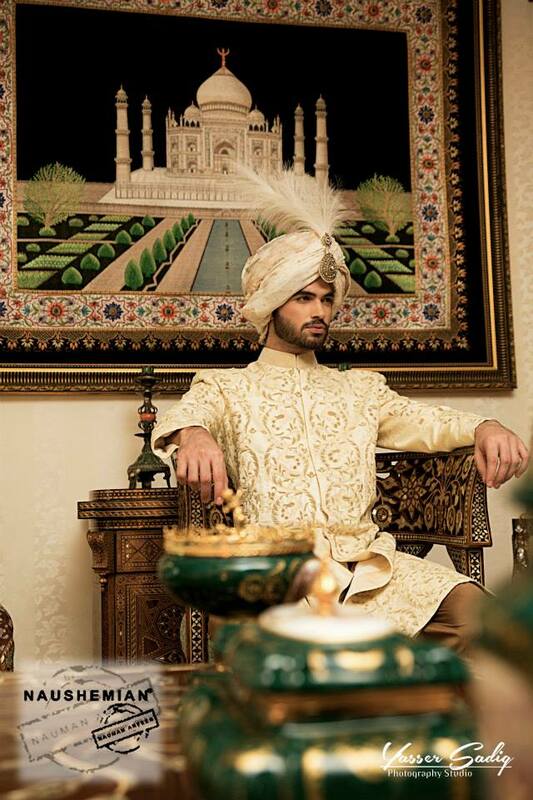 Some designs have Kashmiri hand embroidery with a soothing color palette. 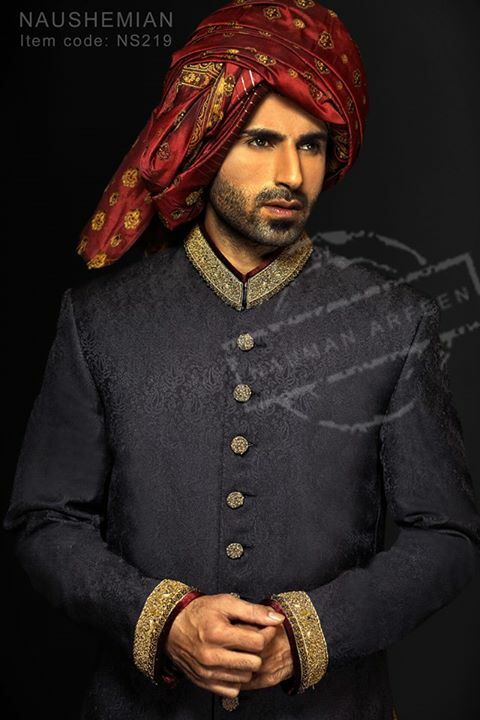 The sherwanis have open front owning metallic buttons in which motifs are embedded to give the fancy glimpse. 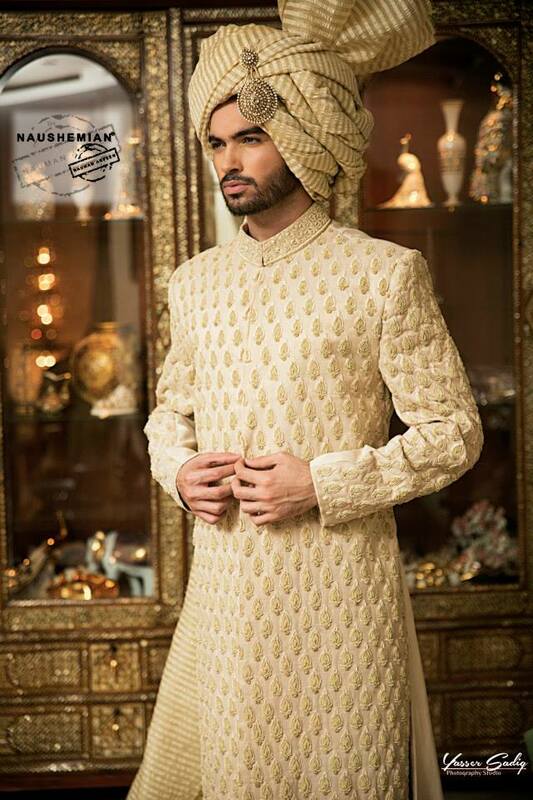 The gold color looks very fresh together with copper thread work. 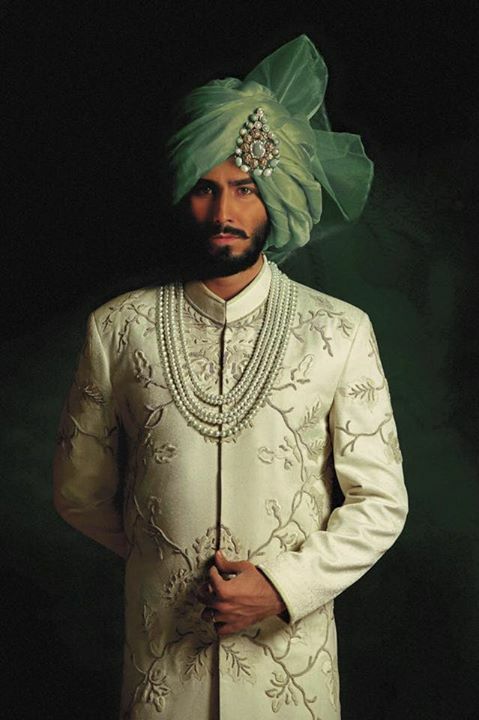 Beautiful floral embellishments are done with off-white shades that are really a perfect piece of weddings. 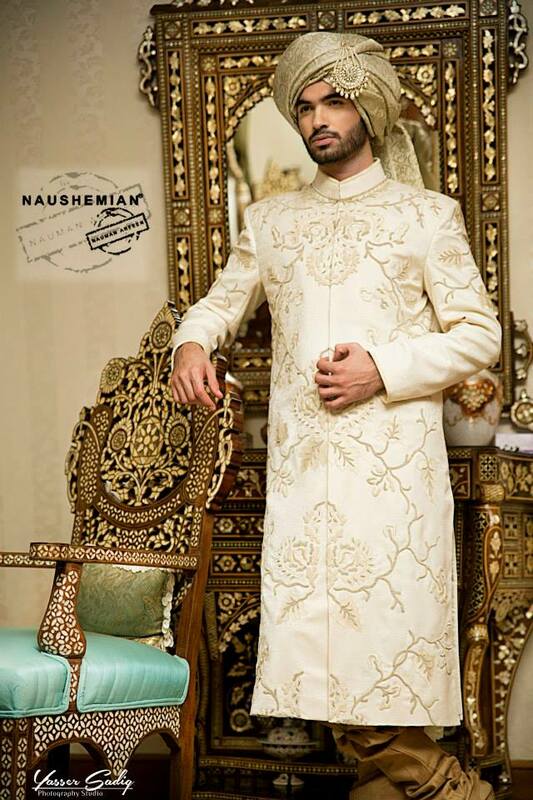 Other than this brown shades, navy blue, white, black, beige, mint green, dim orange, grey are implemented upon the quality fabrics to produce masterpieces. 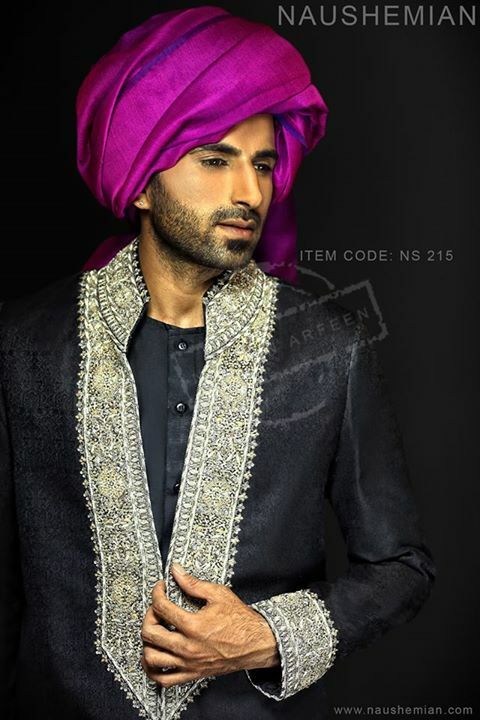 Stuff like jamavar, silk, Karandi, blended are utilized. 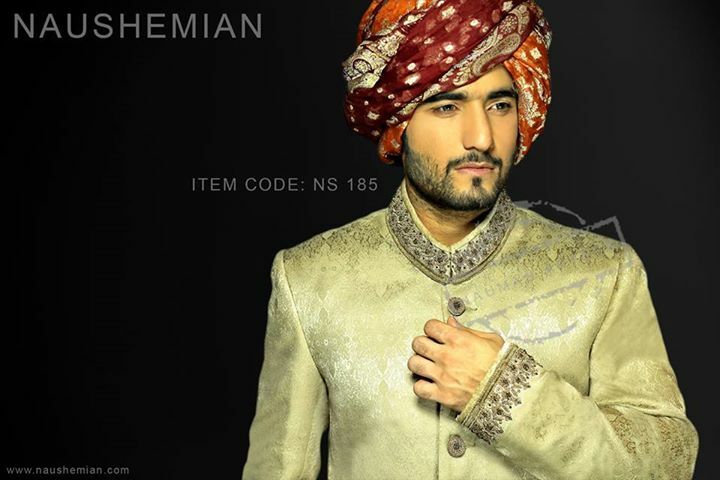 The dresses are full of glamor and charm and styled with the hottest men fashion trends. 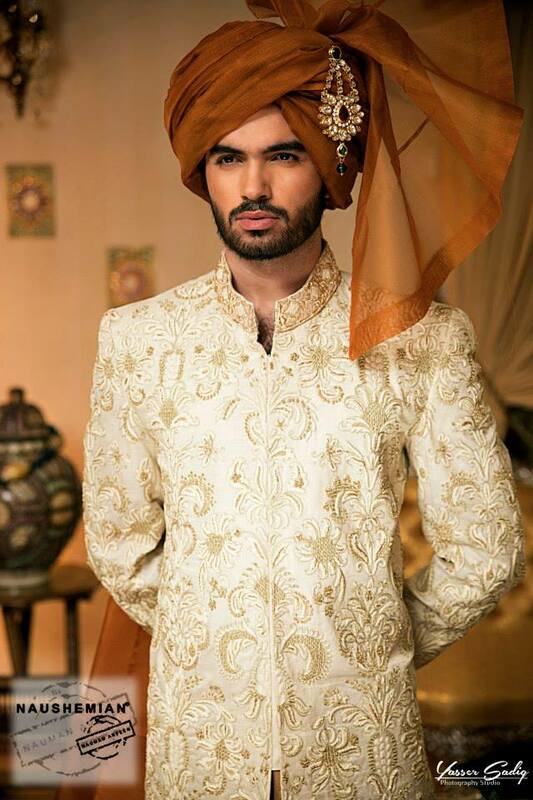 These outfits are best for your wedding dairies. Here below we are showcasing the image gallery from this collection. I hope you will fall in love with them and desire to buy. 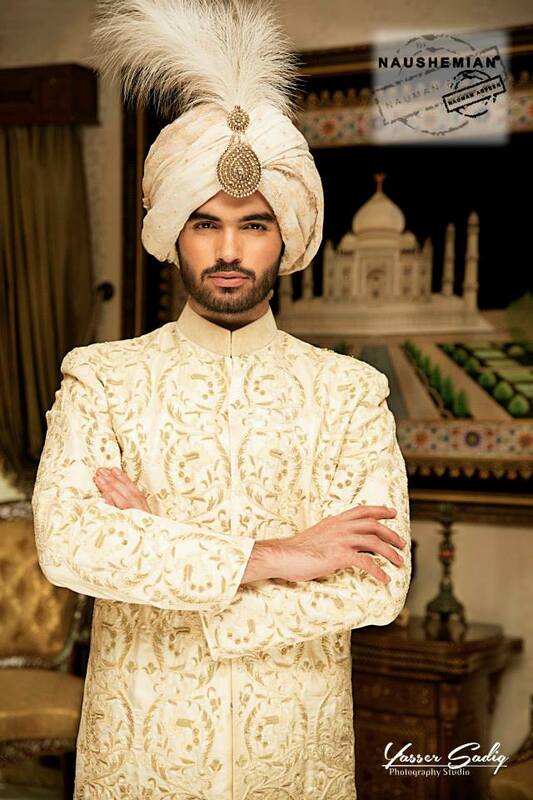 Be the best groom ever by wearing these mind-blowing designs!